I'm using the third edition of the Basic English Grammar book and in chart 14-2, it is mentioned that they are as many as 18 adjective categories but the book doesn't go that far as to mention all the categories. My students are very curious and want to know all the other categories; I did a bit of online research but I cannot seem to find them. Can you please help me with the rest of the categories? 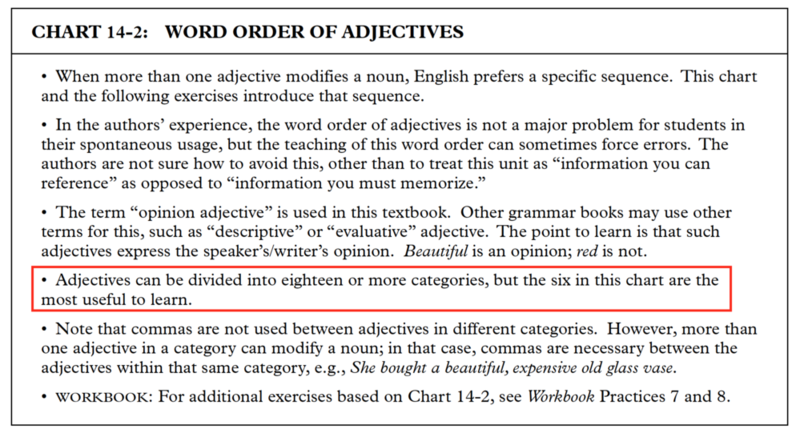 I'm using the third edition of the Basic English Grammar book and in chart 14-2, it is mentioned that they are as many as 18 adjective categories but the book doesn't go that far as to mention all the categories. Hello, Ceci, and welcome to the Grammar Exchange! I'm using the fourth edition of the Azar books, and the fourth edition of Basic English Grammar does not mention that in chart 14-2. It seems to have been edited out, perhaps because it was leading to questions like yours here. The categories of adjectives are not absolutes. 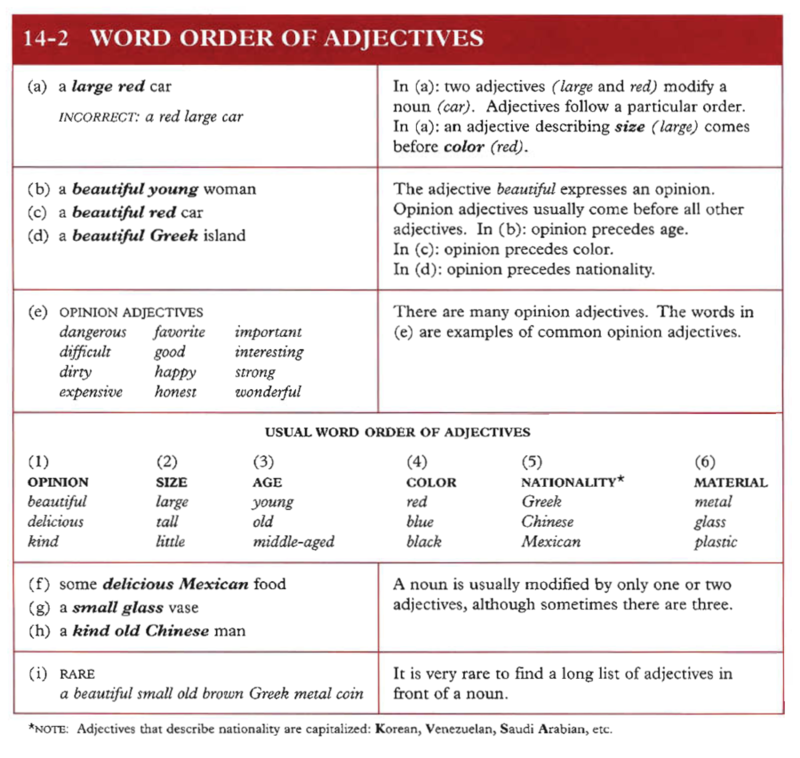 Different grammarians will categorize adjectives in different ways, depending on the reasons for making the categorizations and on their own inclination. I can assure you that the statement you've asked about is NOT to be interpreted as implying that a noun can be cumulatively modified by a string of 18 adjectives, each belonging to a differently hierarchized grammatical category. I wasn't referring to the usage of the whole 18 categories to describe a noun, just looking for the order in which to use them. I'm from Monterrey, NL, México and I've been a teacher for about 6 years or so now. After doing a bit more research online across different sites and I put up a list of the so called categories. Thanks to both of you for taking the time to reply back to me. Thank you for sharing so much material and so many details about you, Cecilia. It is clear that the authors do not attach much importance to the 18 or more categories of adjectives. I think what you should make clear to your students is that the order is approximate. The second bullet point in the teacher's book is particularly enlightening. I think your list omits nouns in attributive position (with only some of them denoting material) and participles, both present and past, which when designating the type of noun will tend to remain next to it, as in dancing shoes or baked potatoes. 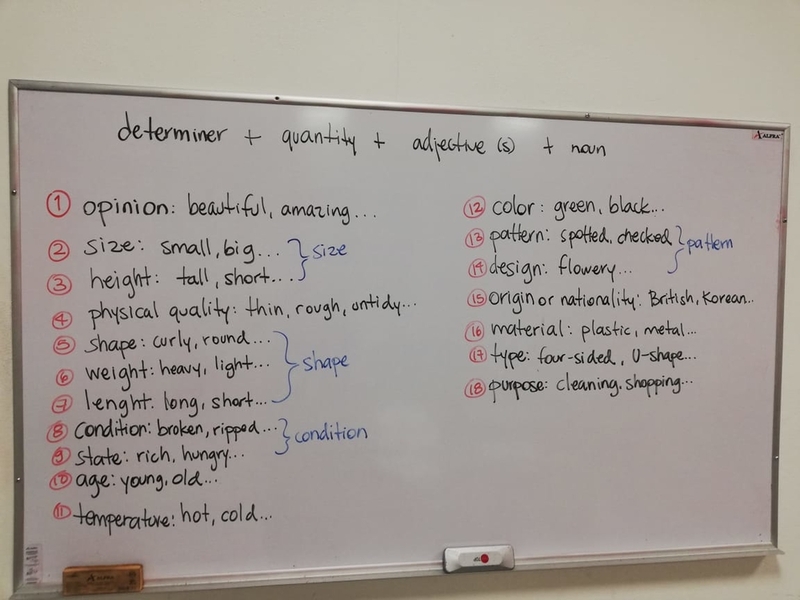 Perhaps more interesting than the order of adjectives is the order of determiners for teaching purposes, don't you think? I agree Gustavo. I told my students that the order is approximate and that is not written in stone as I have found with many charts in the book that state something as a rule only to say later that is not really a rule rule. I agree that I'm missing the nouns but since we were doing exercises with only adjectives, I focused on that only. I have found that sometimes the more research I do in order to provide more information to my students the more I end up confusing them. Where on my list would you put the nouns and the participles? Thanks for the reply, Gustavo. Can I ask you another question? (Man): Dr. Brighton’s Biology quizzes are short and tricky. Maybe I do, but I cannot explain it; considering "if you understand it, you can explain it" then I don't understand it fully. What troubles me is the "though" part. I think the "aren't they" is an agreement of the statement he made and I just can connect the two parts. Next time you ask a question that is not related to the contents of the thread, please start a new thread. Thank you. I think that question tag will sound like an exclamation rather than a question, and that it will mean something like: Nobody can deny that! / Of course they are! Without "though," aren't they would sound like a real question. I agree with Gustavo's answer, as well as with his point that your new question here, Cecilia, should have begun a new thread, insofar as it introduces a new topic -- one which is very interesting. I can't recall anyone on GE ever having asked about this special use of "though" in tag questions before. You are right, Cecilia, that this type of tag question expresses agreement. It is as if the person responding with the tag pretends that he or she has made the statement with which he or she is agreeing. Other things we sometimes say in these contexts include "It's so true!" (colloquial) and "I couldn't agree more." Thanks again and sorry for not starting another thread. I'll go ahead and start another one since I have another question.